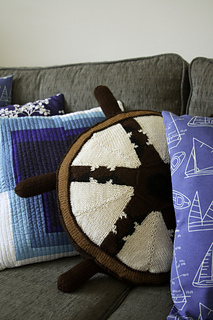 see that you have a boat-printed pillow and what? Is that a knitted ship’s wheel?” Indeed. becomes the edge of the wheel, then knit the outer edge to the halfway point. Once you’ve made two identical pieces like this, you graft them together to create the whole piece. Then you make 3-D spokes and sew them to the outer edge of the piece, creating the part of the wheel that the pirate uses to steer. Ahoy! Yarn: Knit Picks Brava Worsted, 100% Acrylic; 219yds/100g: Sienna (MC), 2 skeins, Cream (CC1), 2 skeins, Brindle (CC2), 1 skein, Black (CC3), 1 skein. Needles: Size 7 (4.5 mm): 24” or longer circular (cir) and double-pointed (dpn). Adjust needle sizes if necessary to obtain the correct gauge. Notions: 18” round pillow form (available online or at a store like Joann’s) OR a large bag of toy stuffing, waste yarn, tapestry needle, toy stuffing for spokes.